Hollywood continues to dip its wick into the business of myth-making. This is the live-action version of the hugely popular 1991 Disney animated musical with all the songs from that production, plus a handful more. The PC element is still there. Emma Watson plays Belle as a feminist icon: a slightly nerdy, prim literary sort who yearns for an intelligent mate to spark off in the library. Not surprisingly she longs to escape her small-minded, provincial French village as well as her dumb suitor Gaston (amusingly played by Luke Evans). And, for the first time, there’s even a “gay moment” – which you’ll miss if you blink – which has resulted in the movie being pulled in Malaysia and given a prohibitive age restriction in Russia. Beauty and the Beast is, of course, almost as old as what we like to call civilization. First written in 1740 by French novelist Jeanne-Marie Leprince de Beaumont, the tale goes all the way back to the classical myth of Cupid and Psyche and has been written, performed and filmed on innumerable occasions. Directed by Bill Condon (Dreamgirls), Disney doesn’t spare the bucks in this lavish, shiny version. A budget of $160 million (a monstrous R2.3 billion) has bought Condon a veritable army of experts in the fields of special effects, visual effects, production and costume design – and you can see it all up on the glowing screen. The plot is simple enough. The Beast began life as a handsome but thoroughly flawed French prince who taxed his people unmercifully to pay for his lavish lifestyle. An enchantress (Hattie Morahan) duly turns him into a beast when he rejects her plea for shelter on a brutal winter’s night. In addition, all his main courtiers are cursed into becoming household objects with Ewan McGregor playing Lumiere (a candlestick), Ian McKellen as Cogsworth (a clock), Emma Thompson as Mrs Potts (a teapot), Andra McDonald as a wardrobe and Gugu Mbatha-Raw as a feather duster. 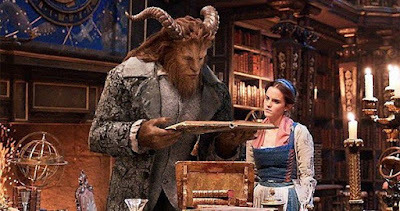 One day, Belle’s eccentric dad (Kevin Kline) accidentally stumbles into the Beast’s lair and is first imprisoned and then released when brave Belle volunteers to take her father’s place. The scene is now set for a touch of horror, hijinks, and eventually high romance. It has to be said that the demure Watson doesn’t exactly set the screen on fire, but she is not intended to be a glamour puss or a black widow, so her girl-next-door performance is solidly respectable. One of the main themes of this fairytale, of course, is that beauty isn’t skin deep: the beast must express what is in his heart to get the beautiful girl to fall in love with him. Gaston, by contrast, may be muscular, handsome and adventurous, but he’s no catch for Belle because his inner self is so thoroughly rotten. This is a massive production and Condon manages to pull it all together with great efficiency. There’s plenty of humour, particularly among the far from inanimate household artifacts with Ian McKellen and Emma Thompson to the fore, while the songs from Alan Menken (who is also responsible for the score), the late Howard Ashman, and Tim Rice are as hummable as ever. BATB is the ultimate family film and should be a sure-fire hit.